Here we go again. The framing of new cycling policies and infrastructure in New York as a “war.” This time it’s cycling advocates regurgitating this unhelpful construct. It’s in the form of a slickly produced video from EcoMobility. The cycling advocates in this video are attractive and well-spoken. In the other corner, representing the anti-cyclist position, is one hostile and inarticulate cab driver filmed from behind–presumably surreptitiously. cyclelicio.us has published a 2010 Holiday Gift Guide. We agree on the Burley Travoy commuter cargo trailer, but nobody loves cycling socks quite like cyclelicio.us. Read it carefully; not every suggestion has a picture. 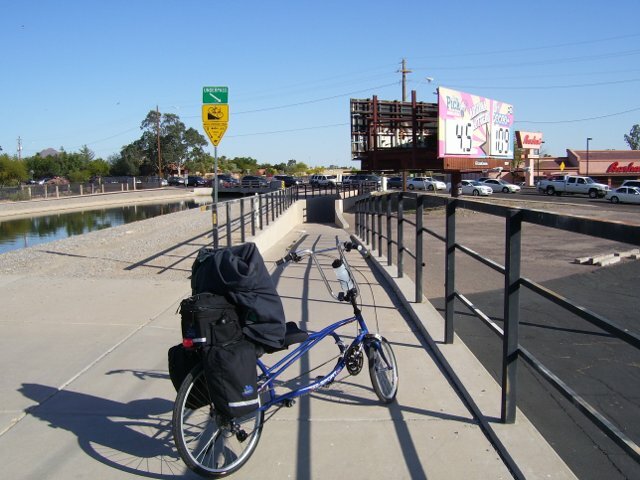 Growing up in Phoenix, I knew that one of the best ways to get around by bike was to use the paths along the irrigation canal system. Now Phoenix and some of its suburbs are also using the canals as part of a broad collection of cycling projects. The bike-friendly 20-mile light rail system, in operation only since 2008, is a catalyst for an increase in bike commuting. The sprawling Phoenix Metro Area doesn&apos;t have traditional commuting patterns, where residents travel to just one central downtown area, so giving bikes easier access to the trains has made a measurable impact along the light rail corridor. "In my own case, I live in south Scottsdale about 15 miles from the office, but only three miles from the metro station," says Kerry Wilcoxon, Traffic Engineer III for the Street Transportation Department at the City of Phoenix. He says that the ability to ride to the train has changed the way he commutes. The basis of canal system is more than 500 years old, originally constructed by a pre-Columbian civilization known as the Hohokam. This makes the bike paths in Phoenix more than 400 years older than the first Dutch bike path, right? Earth Studio out of Moab, Utah, carries handmade metal art and decor for just about everyone. We especially like their cycling Christmas ornaments, and this year they have some new designs for you. I ride the Arizona Canal every day on my commute to work. There are some terrific paved paths along the canals for riding already. What is needed is some overall vision that integrates these paths with the surrounding communities, along the lines of Canalscape, for example. One recent project that took steps in this direction was the Highline Canal. And if you happen to visit Phoenix and want to learn more about the Hohokam culture that built the canals, you could visit the Pueblo Grande Museum, which is accessible from the airport without a car via the Light Rail, cycling, or just walking from the Sky Harbor Connection bus stop on Washington Street. Yes. Like JRA, in my daily commute I include the paved paths which parallel two of the Phoenix canals. As a matter of fact, one of the MUPs is the only safe way to get across busy Glendale Avenue. If the city would pave a certain two mile section of the path which follows the Arizona Canal, I could safely and comfortably include more of these routes … and shave a mile or more off of my commute distance! Push me a little more and I just might start a Cycle Socks Review blog!